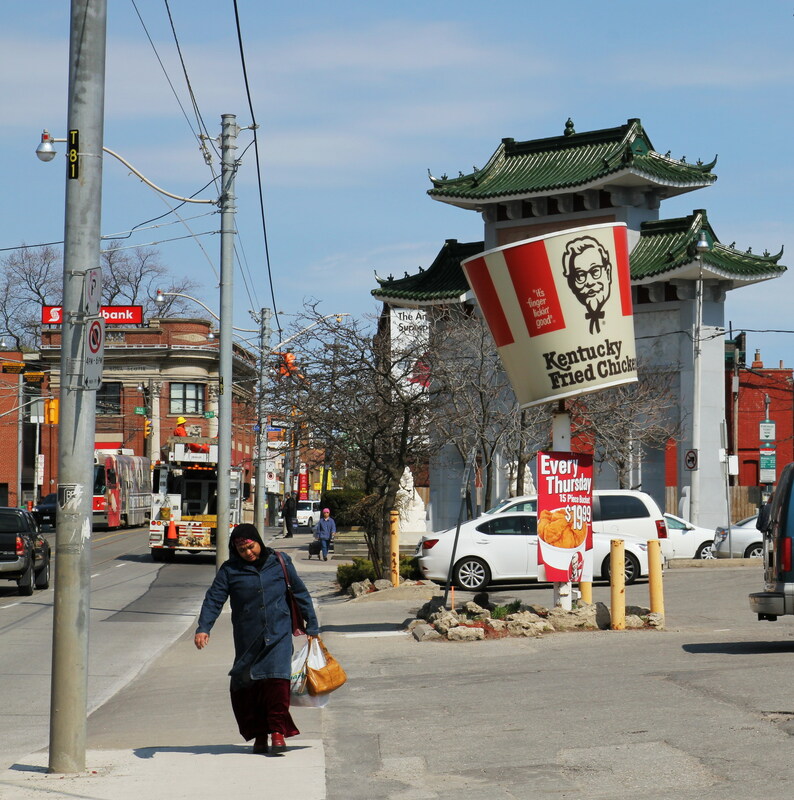 On Gerrard St. just west of Broadview Ave. there’s this large structure of oriental design. Down the road is a KFC. I thought combining the two might make for an amusing photo. The walking lady was a bonus. Happy Sunday everyone. This entry was posted in Canon EOS T2i / 550D, Downtown Toronto and tagged Digital Photographs, Digital Photography, Downtown Toronto, Photo Art, Photographs, Photography, Photos, Street Photos, Toronto, Urban. Bookmark the permalink. Yes, the image, juxtaposed elemetos combination of different cultures, how they are distributed in the frame and what they represent culturally these elements can be fun, but more than that. It is an image that represents the load of more than two cultures found in time and space with dissimilar values. Particularly prove to pass the image to black and white because I think that may well achieve more dramatic or greater expressive power. Thanks, and thanks for popping by my blog. I did try it in black and white as you suggested and you’re right, it looks really nice. A bucket of fun. Really great shot Dave. That must be a KFC that’s been around to have a bucket sign. I like your thinking and the inclusion of the lady walking towards you to pull it all together.